Physically moving your body around to move through the virtual world is a great way to enhance immersion, but it can be potentially dangerous if users lose a sense of their real world surroundings. 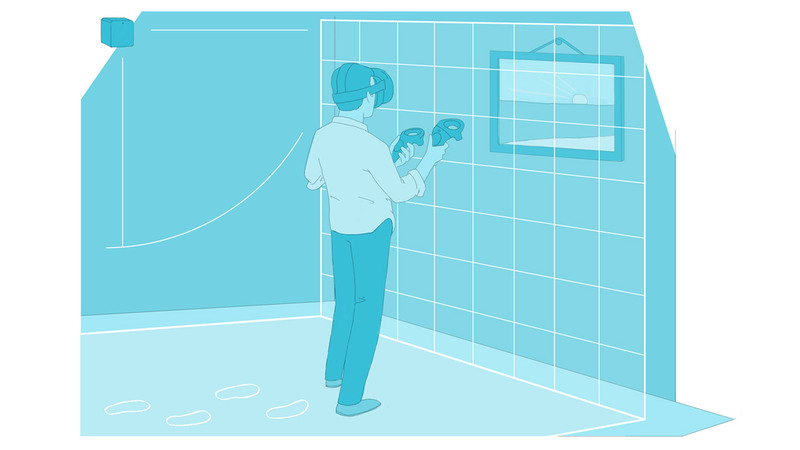 To keep users safe, Valve introduced what they call the ‘Chaperone’ for the HTC Vive headset, a virtual wall which appears when needed to keep users from exiting a safe playspace. Oculus is working on their own version of such a system which will be especially important for the upcoming launch of their Touch VR controllers. 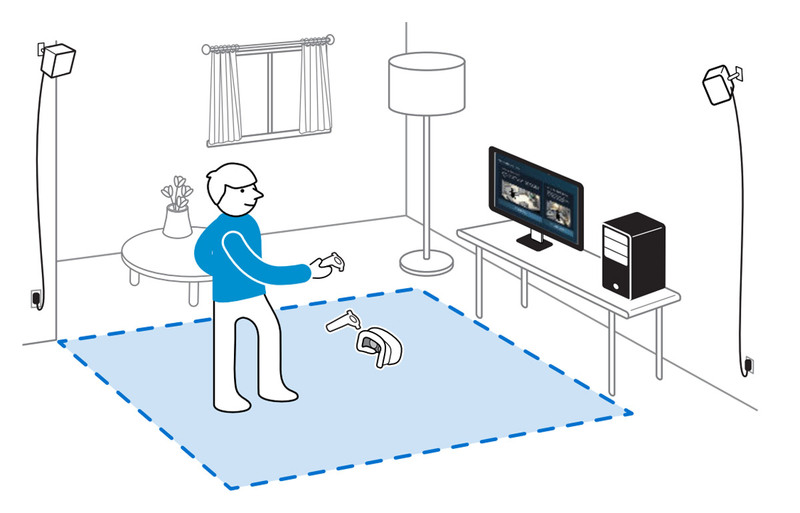 The Chaperone system allows HTC Vive users to map out a safe area in the real world which will be reflected in the virtual world to keep them from walking into walls or swinging their hands into furniture. Chaperone on the Vive has been unquestionably effective, working well enough that users can lose themselves in the virtual world without fear of running into the physical one. The idea of a virtual boundary to keep the user inside a real-world safezone isn’t radical, but it’s not something Oculus has talked much about up to this point. With the impending launch of the Touch VR controller coming by year’s end, implementation of such a system is critical. As it turns out, Oculus has had a boundary system in the works for some time. 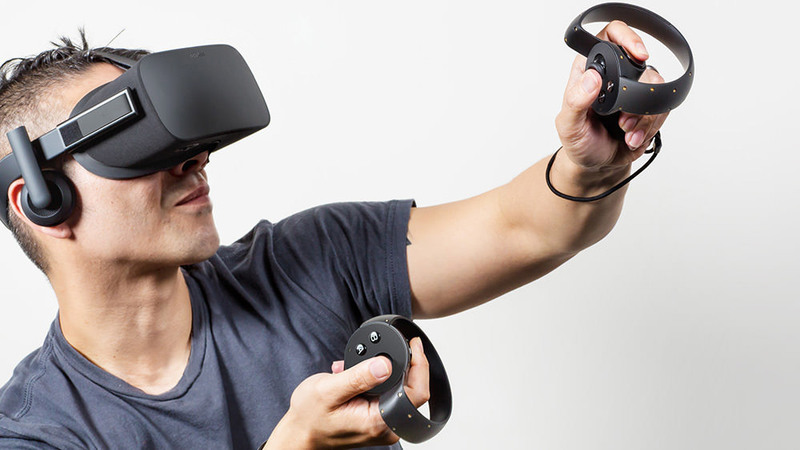 I saw a brief glimpse of it for the first time at a conference in June where Oculus was showing off their Touch controllers. 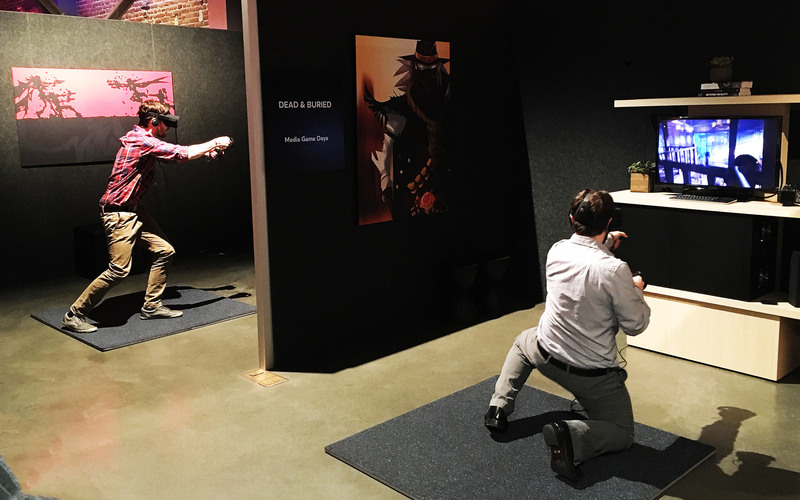 It was after a four player match of Dead & Buried; Palmer Luckey, the founder of Oculus, pulled me aside and asked if I had noticed anything peculiar about this particular build of the game. After saying I hadn’t, he urged me to put the headset back on and then walk to my left. After few steps I saw a horizontal floating line appear in front of me about stomach-height. As I traced it with my eyes to the left, I could see that it encompassed me entirely, appearing like a square with rounded corners. Interestingly, this boundary wasn’t actually just a line; it appeared as a piece of barbed wire, fitting with Dead & Buried’s Western aesthetic. This suggests of course that developers may have the ability to style the Oculus boundary system to suit their game. Chaperone on the HTC Vive, on the other hand, can be customized by the user, but I haven’t ever seen it styled on a developer controlled, per-application basis. While we’d expect the Oculus boundary system to initially launch with the Touch VR controllers (given that it will mean the move from seated to standing VR for many users), it’s reasonable to think that the system might be useful even for seated VR experiences which use a standalone headset. I’ve seen people immersed in a seated VR experience bump their headsets on a desk (and done it myself plenty of times). While we’re likely to hear more about Oculus’ boundary system at the company’s ‘Connect’ developer conference this October, one major unanswered question is whether or not Valve’s pending patent for Chaperone (or more specifically, “Sensory feedback systems and methods for guiding users in virtual reality environments“) might present any issue to Oculus if it were to be granted. Interestingly, Valve’s own Chaperone system actually already works with the Rift for users who have the headset connected to Steam. Question is still if it was implemented in Dead & Buried specifically or if anything was actually passed on from the runtime. It is suggestive though, as this is a first party title, looking forward to hear about everything come Connect 3, even if I’ll be following it through the Internet. I think the rubbermat principle is a great way, as this is about as much space as most people will have in their home.. Only a few people actually have space at home for real roomscale, and if you do, you’re just one of those few people.. I don’t think anyone has stats on that but either way the distance you need to remain from the walls depends on what you’re doing. If you’re just exploring, looking around a space, going right up to the boundaries can be fine. If you’re swinging swords you’re going to want plenty of buffer. Better to let software handle the boundary, IMO. Within a year from now when Google Daydream devices and phones with Project Tango environment mapping built in and Intel/Microsoft Project Alloy with Intel’s RealSense cameras for environment mapping built in, room-scale will be no limitation at all as entire homes, offices, industrial complexes, neighborhoods, parks, etc., will be mapped as the environment for which games will adjust themselves to, as seen in this experience, https://www.youtube.com/watch?v=e0XNlsXnKp0, except it will be with VR headsets on. Further, there will be no need to clear furniture or other items out of the way, unless you want to, as they will be incorporated into the virtual environment as objects or borders that you will avoid as you would in real life. It’ll be more than a year, and you’ll still need to know where boundaries are. It detects walls, floors, furniture, and other objects–those are your boundaries. When used in Daydream VR mode, I’m sure there will be some Vive Chaperone-like boundary display that materializes as you get close to a boundary, sooo yes, you’ll still need to know where boundaries are, and Tango devices will determine them for you automatically. Of course, you’ll be able to mark things specifically for those things undetected or incorrectly detected. The game or app can then determine what to do with those boundaries: display a Chaperone warning when you get close, or render them as walls or immovable objects. You only need to map an environment once. Thereafter, it will be available for any app to use however it chooses. You’ll even be able to share environments that you’ve mapped–your office building, for example–or load environments that others have mapped–the nearby shopping mall, for example. The main use of the latter will be for shop-finding with turn-by-turn walking directions and an augmented path projected for you to follow. Great, I don’t want games to use my environment, I don’t see the point of that.. Maybe you do, but I don’t..
And don’t count on Daydream devices and environment mapping devices to be fully available, and actually working properly, next year, that’ll take a couple of years..
Oh, September seems pretty close to me: https://www.youtube.com/watch?v=l2kyIJ7pHxU. It’s Daydream compatible. And you’ll probably see at least ten more before Christmas this year. Don’t forget, Google has been working on Project Tango for about FOUR YEARS now. It’s time for it to come out of the lab. Has it been verified that Daydream incorporates Project Tango? A Daydream device CAN include hardware to support Project Tango. It is up to the manufacturer of the phone/headset. Will Project Tango-enabled phones work with Daydream? Google has confirmed it, but as of yet, hasn’t shed any details on the plan. Neat. Still seems like there’s no word if it’s able to provide reliable enough positional tracking for room scale VR yet though. Real-time outdoor mapping on a bicycle: https://www.youtube.com/watch?v=x5C_HNnW_3Q. Once an object or environment map is captured, it can be shared in a cloud repository so that anyone or any game or app can access it for use. Not kidding at all. Last direction I heard to Tango developers was that tracking was sufficient for positional AR use only, and that relying on it for VR outside of simple rotational data was not recommended. As I understood the reason was refresh rate and consistency in full VR needed to be at a much higher standard to avoid sickness and provide presence, while AR generally has more than enough constant reference points IRL to stop motion sickness with less reliable data, and presence isn’t necessarily required to make that type of experience satisfying. I’m not sure if things have changed and it’s now ready for prime time, but all of the applications you reference certainly do seem limited to AR usage as well. I also would’ve expected to hear words from John Carmack on the matter had his pet problem been solved by someone else. Ahhh, OK. I wasn’t aware of this. Makes sense though. I suppose then that those phones touting support for both Daydream and Tango will certify Tango use in AR mode only. I was kind of hoping you knew something I didn’t ;-). Not that AR doesn’t have it’s charm, but without room scale VR I think Tango’s most valuable proposition is 3D mapping. I assume they’ll crack it eventually, Project Alloy claims to have already, but it is disapointing they didn’t make it in time for Tango to be part of Daydream’s minimum specs. Agreed. It is disappointing that Project Tango and Daydream together aren’t yet a workable environment-scale VR solution like Project Alloy. I think a lot of people, including me, were expecting it to be. If it’s truly not, I think Google really missed the target that the VR market is seeking. It’s great to be untethered, but to be untethered sitting or standing in one place doesn’t benefit you much. Perhaps in this first iteration then, as you imply, Google was targeting non-real-time applications for Tango in VR, such as scanning and importing objects and environments for import into 3D composition environments, and its real-time usage is for AR. They actually demoed Tango for VR a while ago, but apparently ended up scraping it for the commercial release of daydream. It’s a non-winning argument. Those who like the idea of room scale are simply going to make it the “winning” point. I want to try room-scale on Oculus, it would be fun. But 99% of my play will revert to sitting. There are obviously a few gamers who will dedicate the space, but the vast vast majority (as studies and common sense have shown) simply don’t have that type of real estate in their homes. Give it a year and room-scale won’t be mentioned in the differentiatiors to which system you will buy. The real differentiatiors in the near future will be a competing or 2nd generation device getting 4K resolution as video cards and drivers/apis like vulkan & directx12 get more power. Did they actually say that this would be a Oculus-wide system as opposed to just something they built for D&B? Why even bother with the oculus when the vive already has all this in place with a longer cord for a larger room scale…. Shut up, no way! Really? Maybe because many folks aren’t too keen on the velociraptor-style wands that the Vive uses, nor the differences the headset has from the Oculus. USB and HDMI Extenders can solve the problem of cable length easily enough. The Touch is clearly a better design than the wands, and with using either it’s own method for chaperoning or utilizing the open one with Steam for room-scale, suddenly the Rift resumes its role as a major player. This isn’t meant to demean the Vive, only that not everyone sees it as the only (or even best) solution. Since Valve made their lightroom technology open, anyone (who payed a license fee of 3000$) will be allowed to make and sell their own controllers. So if you don’t like the vive wands, just wait and new ones will be released shortly. “shortly” ? you mean you have no clue when that will happen. Because the vive hmd is an eyesore for a consumer product and believe it or not but the rift hmd + touch will be a better combo. The only reason vive has been better thus far is because of the controllers.